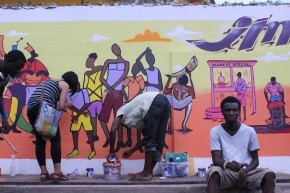 Local artists collaborated with youth to paint a mural at Club Ten in Kanda, Accra. 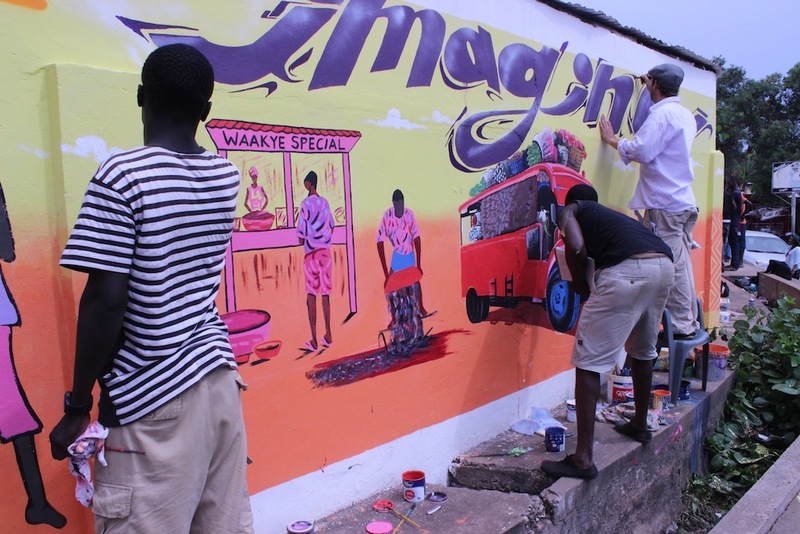 The initiative, themed “Imagine Accra,” was lead by Nima Muhinmanchi Art, a local arts NGO that works to promote creativity and youth development in the Nima community. 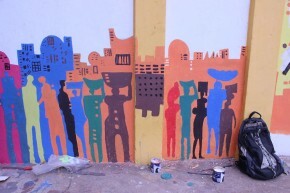 These days, commuters and residents along the Kanda Expressway between Kawukudi and Kanda have a new view along their community landscape: a bright, expressive art mural at Club 10 junction, painted on a family’s high, cement wall and running more than 50 feet long. “Imagine Accra,” the mural commands in bold, curving purple lettering. 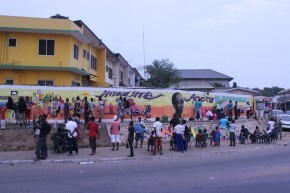 The command is accompanied by a set of familiar scenes — a tro-tro, a waakye food stand, people dancing Azonto, even the face of Kwame Nkrumah (a visionary and the country’s first president). 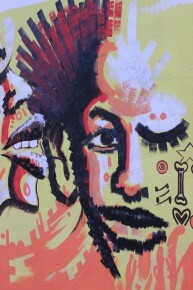 In Accra, a city where telecom, movie, church and other entities use the spread of public and private walls for promotions (or in the case of the AMA, to document land use infringements), the existence of wall art — such as graffiti or in actual murals — is few and far between. The local arts organization Nima Muhinmanchi Art (NMA) is not only trying to change this, but is also involving local youth in the process. 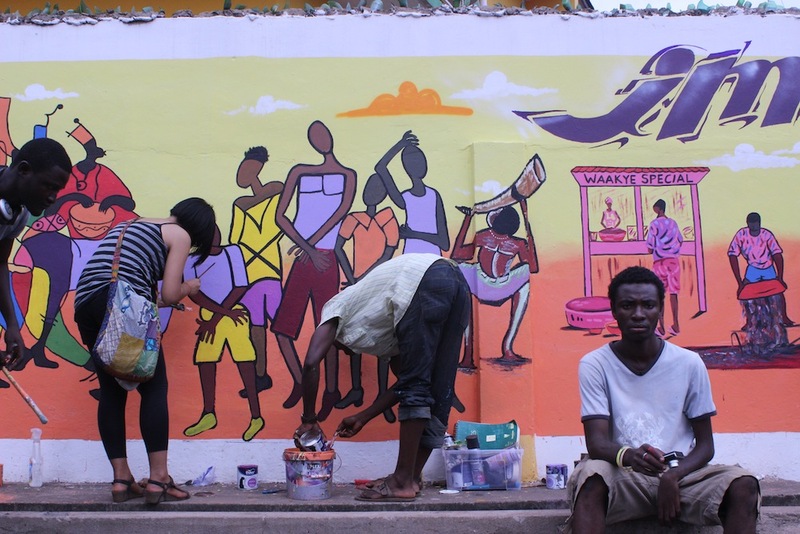 The Club 10 junction along Kanda Expressway, which separates the Kanda neighborhood from Kawukudi, was the latest in NMA and Nima youth’s creative endeavors. 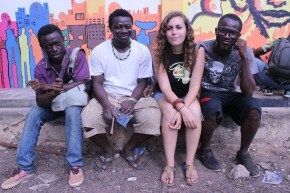 From left: local artist Aguda Andana, Musah Swallah, Robin Riskin and Larry Aminu of Nima Muhinmanchi Art. 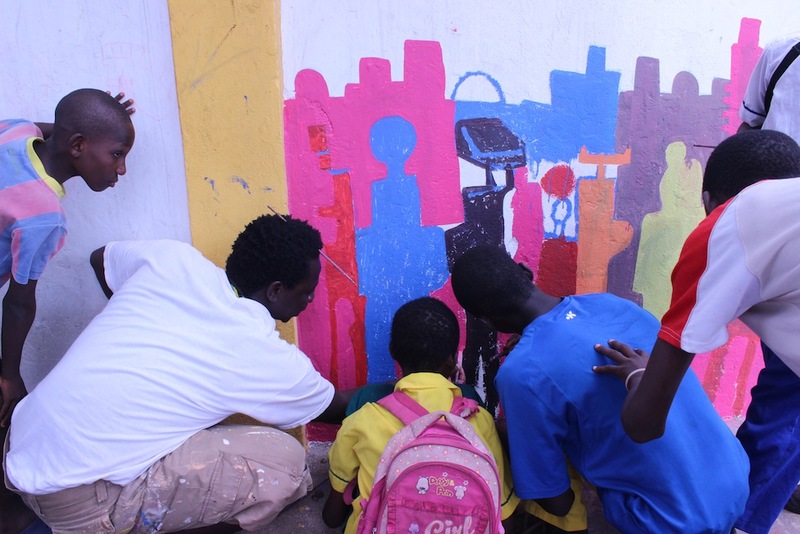 Over the past two years, NMA has been empowering youth in the Nima community through artistic expression, and enabling them to showcase their skills and beautify their community spaces. 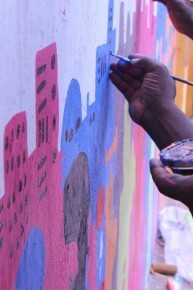 In addition to training and encouraging their youth to learn and create art traditional canvasses, the organization takes their artists’ work public: From the Kawukudi park mural to the Village Garden Toilet, the organization uses walls and urban spaces and repurposes them for art. 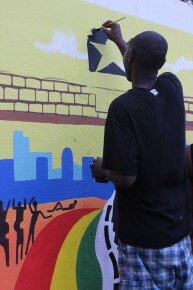 Musah Swallah, a local artist and leader in NMA, paints with Nima youth along the wall. “We think the present is not the best, we need more development. when it comes to education, economic social [aspects], everything,” he says. 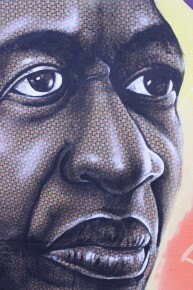 Painting of Kwame Nkrumah, Ghana’s first president (and to today considered one of the country’s foremost visionaries), at art mural at Kanda. Larry Aminu, co-creative director with Nima Muhinmanchi Art stands in front of the Kwame Nkrumah painting that he helped create. 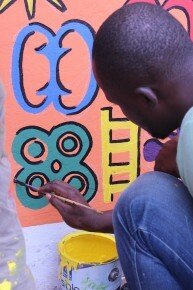 Local artists painting along the mural at Kanda. 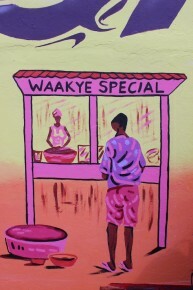 Representation of a foodseller selling waakye (local food of rice, beans, noodles and gari), along the art mural wall. 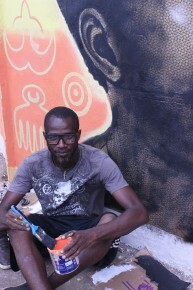 Local artists at work imagining Accra. 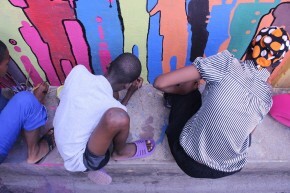 A young brother and sister from Nima helping to create art along the mural wall. Shot of the wall from across the street, along Kanda Highway. 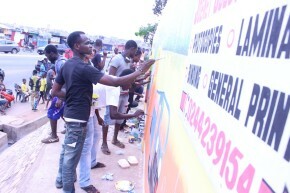 Local artists and youth at work. From right: A local artist, Musah Swallah, Robin Riskin and Larry Aminu of Nima Muhinmanchi Art. 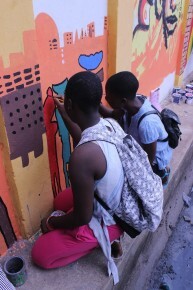 Local artists and youth at work, imagining Accra.